It may be barely 7am here in Arizona but I swear I just heard one of the Kevins (Lee or Olson) say that Jay Howard has been given the rest of the month off. 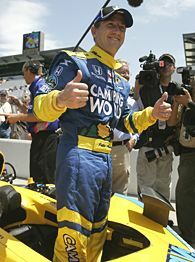 According to the unknown Kevin, John Andretti has been given the thumbs up to drive the Roth Racing #24 machine for the Indianapolis 500 only. And just as this is being typed the video is now showing John Andretti on the track. (In a race car, not just walking or anything.) I guess that's about all the confirmation we need. John is already up to 220 mph while his father's nephew's son (or uncle's grandson, if you prefer) named Marco is topping the charts at 228 mph. Marty should take himself out. I have to agree with anonymous. Marty is the one who should be sidelined. Make it three of us. I got four. Anyone wanna go for five? I am glad for John Andretti!! Go John!! I am ALSO glad for John Andretti!! Go John!! I hope John finally gives up NASCRAP. now, Marty should get out of the Car and hire John for the rest of the season. John Andretti and Jay Howard would make a decent team. now Marty should focus on getting sponsors and running the business side of the team. now we need John's bro Adam in the indy Lights !! This latest move by Marty Roth and Roth Racing has got to be to worst to date. Removing Jay Howard from his car and replacing him with John Andretti is just pure stupidity. Marty, who has not shown anything over the years, signs a talented driver in Howard who has been pretty rock solid with the exception of his first race in Homestead. Jay has been finishing races, Marty has been crashing out or being called in to “park it”. Marty’s ego is getting in the way of acting like or even coming close to acting like a true team owner. You don’t take your future star and bench him. And what has John Andretti really accomplished in the 500’s when you think about it not to mention his performance in Nascar? A total blunder, bonehead move, in my opinion. Where at one time I rooted for the underdog, I can’t root for Marty Roth anymore. He is just totally out in left field on this one. For Jay Howard’s sake, I really hope another team picks him up for the 500 and gives him the opportunity he truly deserves and he leaves Roth. Marty just shafted the guy who is the future foundation for Roth Racing. Maybe it’s time Jay Howard return the favor. sad but its money, i was kinda getting to like howard, that said its nice to see him at Indy. Maybe Roth can see if John is available for any of those roadcourses coming up. Its not money, I can tell you that. John's team that he runs for in NASCAR is unsponsored. It's talent, John has run more 500 than Jay. But Marty has done poorly in IndyCar as Jay is a rising star, plus Jay finished 2nd in the Freedom 100 in 2006. Marty should replace himself with John or Wade Cunningham. No, John is definitely bringing money to the deal. Not a full-boat sponsorship, but he does have a check in his pocket. Poor Jay Howard is getting the full "Prince Harry Pulled from The Line of Fire" royal treatment. Now the question is just how badly does the IHJ want Marty and Milka bumped from the field...my guess is pretty badly. I'll bet you money that AJ fields another car if Marty or Milka are on the bubble! I wanna see these drivers bumped : Bernoldi, Moraes, Duno, Roth. Did someone ACTUALLY post that John Andretti got this ride - or ANY ride - on TALENT?